It's a bit ironic that I am posting this today since I definitely didn't practice what I am preaching in this post. With a rainy weekend spent at home I should be ahead with blogging, right? Well instead I didn't really do anything (other than send emails, I sent a lot of those) to prepare for the week ahead. I work on my editorial calendar at the beginning of the month and move things around as needed but when checking it last night I realized that I didn't have any posts scheduled to go live today. That definitely didn't leave me all that well prepped for the week ahead which is what inspired todays post! Hopefully by following these tips when Monday morning comes around it won't be as hard to get out of bed and you won't be rushed as you prep for work. Bonus points if you've planned out what you're going to eat for each meal! Already having all of your groceries at your house for you means that you get to come home from work or school without having to worry about stopping at the store on your way. This will also eliminate you feeling like you have nothing to eat and relying on takeout or other options that may not be as healthy. Use your agenda and make sure you know what meetings, appointments, or tests you may have coming up. Just by glancing at the week to come you won't feel the stress of remembering a big commitment right before it occurs. Knowing what you're going to wear and not having to stand in your closet thinking "I have nothing to wear" will be such a time saver when you're already dragging on Monday morning. In the same sense already having everything you need to take with you packed and together will also help! Waking up sleep deprived on Monday is never a good sign of the week to come.Try to start your bedtime routine a little bit earlier on Sunday nights to ensure that you get plenty of shut eye as you enter into the next week. This will help to make everything else a bit easier since you'll have more energy. To-do lists are something I make at least once a day. By making one for the week you can sort out exactly what you should be accomplishing and also reason through how long you think that may take. My next piece of advice, do the biggest task first. I tend to put off a task and continue to dread it all week long and then once I go to actually do it it is never as bad as I was anticipating. By tackling that task first thing on Monday morning you skip all the dread and are already prepping for a successful week to come! I'd love to hear your tips for how you prep for the week ahead and hope that your Monday morning is off to a great start! These are great tips! I try to plan my outfits for the week ahead, but sometimes it doesn't work out, haha. Love these tips! I always try to get some laundry done and my blogging done during the weekends too! 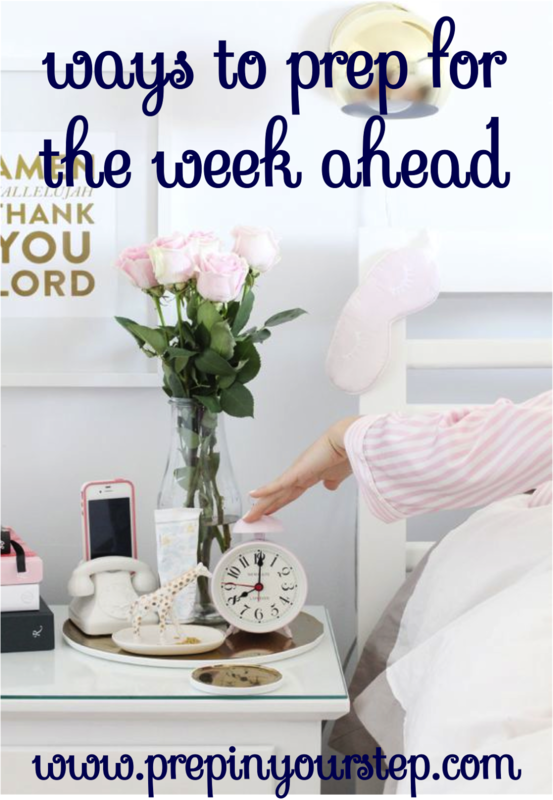 I am always trying to plan out my week before it begins, it usually helps me be more productive for the week! bare the functions the watches offered. Dit is wat ik het replica horloges nederland over had toen ik zei u misschien wel een beetje verbaasd van mijn keuzes. Ik ga meestal voor Breitling for Bentley replica's, ze zijn ook het meest populair denk ik, maar dit één won me over. A1 replica's zoals deze zijn meestal moeilijk te vinden of erg duur. Maar dit is zeer indrukwekkend vanuit mijn oogpunt. Ik denk dat de stalen gaas armband, die wordt gedeeld met de Transocean, geeft het een vintage gevoel en het replica horloges breitling is net als Ik hou van mijn horloges - omvangrijk, met een zeer schone en mannelijk design. Het beste ding over eenvoudige horloges als deze is dat je een zeer goede kopie, alle visuele elementen zijn zeer goed gekloond replica horloges rolex, zodat je rond met het kan lopen als er geen morgen en hoeft zich geen zorgen een beetje, duidelijk een koopje. Vooral met een automatische beweging binnen, waarbij de seconden hand die zwaaiende beweging we altijd begeren voor geeft. replicas rolex usar con seguridad. El corchete plegable también es chapado en oro así que en general esta pieza tiene todos los elementos adecuados en su lugar. Segundos mano tiene un buen movimiento de barrido propulsado por un movimiento japonés automático que mantiene el tiempo bien. Pequeña manecilla de segundos a las 6 en punto y un buen brillo en el reloj Rolex de las 12 en punto le dan a este dial un buen equilibrio en mi opinión. replicas omega cuero que añadir un tono más clásico a su aspecto general. Echa un vistazo al video y déjame saber tus pensamientos sobre él. Non ha un servizio clienti replica rolex professionale, le proprie foto del prodotto o di una pagina di pagamento protetto. Queste cose ci fanno davvero orologi replica dubitare la sua rispettabilità.